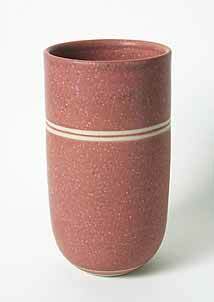 Pink Louise Darby vase - 5¾" (146 mm) high. Louise Darby has been potting in her converted farm building near Stratford-on-Avon since 1983. Her work is mainly hand thrown porcelain and stoneware pots, sometimes with a carved or incised design, often on an animal theme. She uses textures and glazes to good effect and her work is elegant in form and fine in detail.